Meat pechennya (roast) | Шинок "Коса над Чаркою"
Traditional Ukrainian dish of the second part of XVIII century. 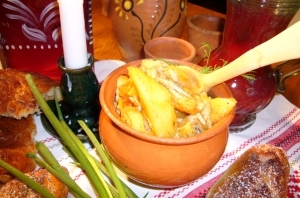 It differed in cooking so that is to the boiled potatoes they added not just various roots and spices but also previously fried meat with onion. Meat and potatoes were placed to the pot and stewed in the oven.